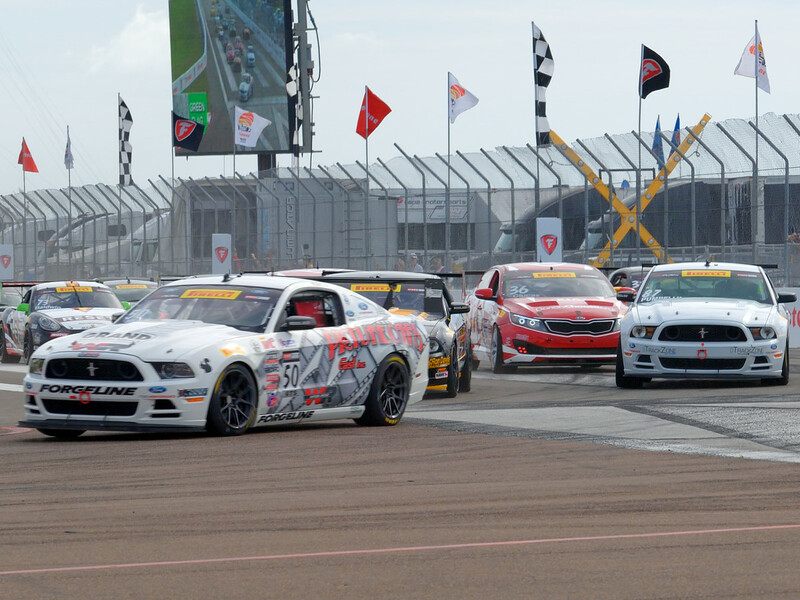 PIRELLI WORLD CHALLENGE ON THE STREETS OF ST. PETE. The Pirelli World Challenge Sports Car series took to the downtown waterfront streets of Saint Petersburg, Florida for rounds three, and four of its 11 event, 20 round championship season. A total of 61 race cars, in four classes, (GT, GTA, GT- Cup, and GTS) made the trip to the sunshine state to contest the Cadillac Grand Prix of Saint Petersburg. The Pirelli World challenge is fast becoming one of the premier sports car racing series in North America, the 50 minute sprint race format, and the Formula 1 style standing starts, are fan favorites wherever the series competes. The race cars are also very, fan friendly, featuring a number of manufacturers that fans can easily identify with; cars that you see on the street every day, in all, over 19 brands are represented within the series. Action started early Friday morning when the GTS cars took to the starting grid for round three of the championship season. Dean Martin from Westland, Michigan, driving the #50 ReHagen Racing, Ford Mustang, posted the fastest qualifying time with a lap of 1:19.001and would start from the pole. Spencer Pumpelly from Atlanta, Georgia, also in a Ford Mustang, would fill the front row of the grid. Dean Martin leads the GTS field into turn one. When the lights went out, Martin got a great launch and lead the field into the tight right hand turn one, Kurt Rezzetano in another Ford Mustang, came from his sixth starting position to second immediately behind Martin, as they negotiated through turn one. Pumpelly, who started alongside Martin, fell into third behind Rezzetano. The three drivers swapped the lead among themselves over the course of the 50 minute event, but when the checkers waved, it was Martin earning his fifth career, Pirelli World Challenge victory, Rezzetano finished a scant .686 seconds behind Martin for second, and Pumpelly took the final spot on the podium. The Ford Mustangs of Martin, Pumpelly and Rezzetano Round four of the GTS class championship series, saw the three drivers again, up front and battling for the top position. A full course yellow came out on lap three for Dan Martinson, who had made significant contact with the concrete wall in turn four. On the ensuing restart, Pumpelly held the top spot, followed closely by Martin and Rezzetano. Rezzetano’s teammate, Andrew Aquilante was able to get by Rezzetano and set out to catch Pumpelly and Martin. On lap 18, Martin slid wide in turn one, opening the door for both Aquilante, and Rezzetano to motor by. 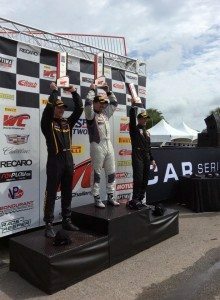 Pumpelly held off the charge of the Calvert Dynamics Ford Mustang teammates, and scored his first ever Pirelli World Challenge Victory. Aquilante finished second, with teammate Rezzetano taking third place honors. Round three winner, Dean Martin recovered to finish fourth.